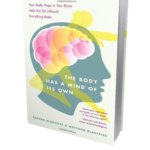 The Body Has a Mind of Its Own: How Body Maps in Your Brain Help You Do (Almost) Everything Better - Jon Lieff, M.D. This is an extremely well written book that describes the unusual plasticity of the many body maps in the brain and the very elaborate interplay of the brain’s view of the body and our surroundings. It is a clear summary of the relevant neuroscience.